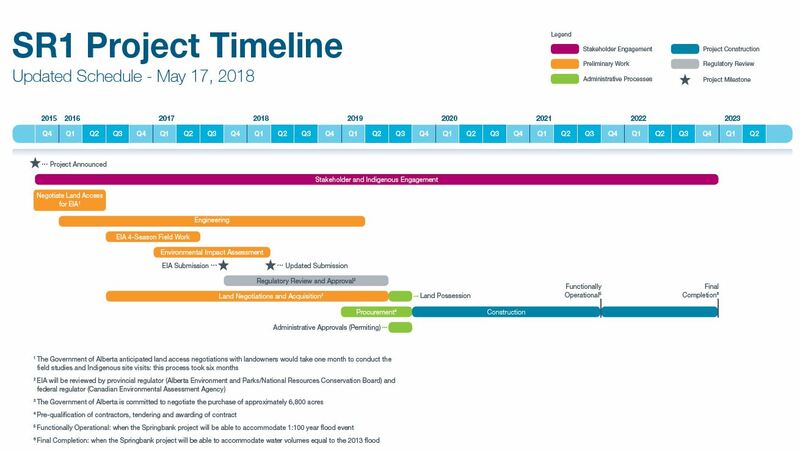 As part of the normal regulatory process, the Canadian Environmental Assessment Agency (CEAA) has requested additional information on the Environmental Impact Statement (EIS) for the Springbank Off-Stream Reservoir Project. The questions are quite detailed and address a range of project concerns including climate change considerations, impact on wildlife, vegetation and soil, and water quality. Throughout each package, the questions focus heavily the impact to Indigenous peoples including cultural experience, traditional use of land and resources, and impacts to Aboriginal and treaty rights. The overall time allocated for the CEAA to review the EIS is 365 days. However, the clock is able to be paused for information requests. The June 29 request stopped the clock at 110 days (elapsed). It is anticipated that Alberta Transportation will complete their response by mid-December. Although the project timeline does accommodate some time for information requests, the clock will be stopped for nearly six months once these three IR packages have been answered—adding up to more delays we just can not afford. If there are no additional information requests, the next step in the environmental assessment process is for the CEAA to prepare the draft environmental assessment report with conclusions on the project. Questions? Comments? Email us: info@floodfreecalgary.com.